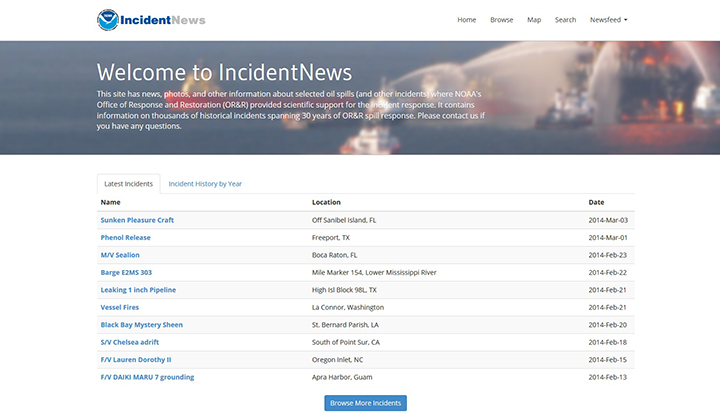 IncidentNews is a website maintained by the Office of Response and Restoration (OR&R) that contains news, photos, and response information about oil spills and other incidents in which OR&R has provided scientific support. This information is provided for and approved by the Unified Command for specific spill incidents. The Unified Command is the group responsible for conducting response operations at the scene of an incident. It is usually comprised of the U.S. Coast Guard Federal On-Scene Coordinator, the State On-Scene Coordinator, and a representative of the responsible party. Information is posted on IncidentNews as it becomes available. The timing of updates depends on the nature of each spill and resources available to post the material. The date of updates is noted on each page. During rapidly evolving events, the site might be updated several times per day. In the later phases of a response, the site might be updated once per week.